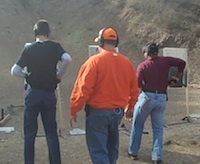 Choosing A Gun (Pistol): Many beginners find it hard to choose a gun even after taking a class. Some listen to the advice of others whom they think are experts. The fact is, there are a lot of factors to consider when buying your first gun. This course/seminar aims to aid you in making the right choice. Students will be evaluated and given several guns to try out in the range.